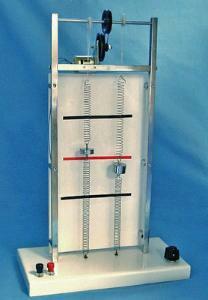 Simple Mechanical System Clearly Conveys Complex Physics Principles. Designed to show the vibration of an object when repeated impulses are applied, this demonstrator consists of two weights of different natural frequencies, two cams driven by a 6V motor with speed control, and four springs. The speed control is used to adjust the frequency of applied force for resonance, so a greater degree of variance is possible.